There are a lot of great resources to help you reduce your waste in your home. One of our favourites, with a fantastic Instagram page, is Waste Free Home Calgary. Heather is a local Calgarian blogger, providing unique, yet simple ideas on how to create a waste free home – with pets, a husband and a little bub! She loves to scheme about ways to make her home more sustainable by producing less household waste and simplifying their lives. One of our favourite tips, just in time for our orange-coloured holidays, is how to turn Mr. J. O’Lantern into a delicious pumpkin puree! The Internet is quick to caution you against eating Halloween pumpkins. They are great for carving, but were bred for size, not taste. Cooked as-is, they tend to be bland and watery. On top of that, if the pumpkin was carved and sat out for a long time, it may be spoiled. If your pumpkin is spoiled, there’s not much I can do to help you, except advise you to take advantage of the City’s pumpkin composting program. But if you’re like us and decorate with whole pumpkins, or maybe your pumpkin was only carved for a couple days, there is a way to make it into perfectly tasty pumpkin puree. The two key components to a good puree are caramelisation and draining.That said, the steps are fairy simple. Cut the pumpkin into large pieces that will fit on sheet pans in your oven. This was the hardest step for me, as our pumpkin was very large. Stab some holes through the skin and flesh in a few spots on each piece. Roast the pumpkin in the oven at 400 degrees until it collapses and the skin is pulling away from the flesh. I left mine in until the skin was black in some areas and I could see the juices collecting onto the pans. After the pumpkin has cooled, peel off the skin and crispy parts, especially where the pumpkin was touching the pan. Puree the pumpkin in your food processor. I found it easiest to use the grater attachment in mine rather than the blade. Set a fine mesh colander over a large bowl, and put your puree in the colander to drain. I left mine overnight and almost two litres of water drained out of the pumpkin. Now your puree is ready to use! 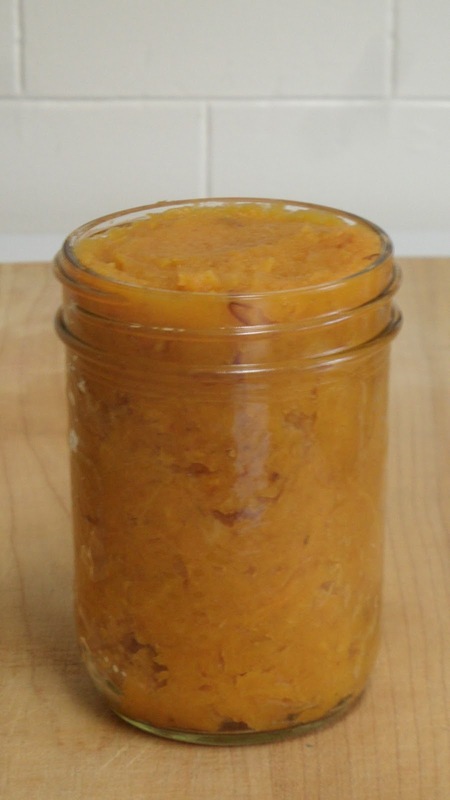 I find this pumpkin puree great for an easy dinner (think of it like mashed potatoes) or baked with eggs in a frittata. It is not quite as sweet as you may be used to with sugar pumpkins, but is definitely flavourful and worth the effort. One large pumpkin yields an amazing quantity of puree.